What does the term "cut-off" mean in the world of poker? 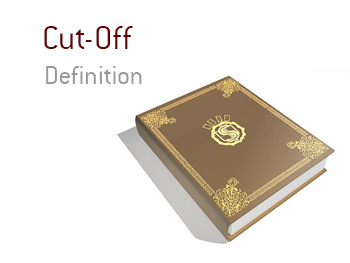 What is the definition of the term "cut-off" in poker? In poker, the term "cut-off" refers to the player who is seated directly to the right of the "button". The player in the "cut-off" has the second strongest position at the table - the only player who has a stronger seat is the "button". For instance - let's say that you are playing in a $1/$2 No Limit Hold'em cash game at your local casino. The player to your direct left is very weak/passive. You are sitting in the cut-off and action folds to you. You look down at Js-Qs and decide to put in a raise. You know that the player to your left (the "button") is likely to fold unless he has an absolute monster. If he folds, then you have the advantage over both the small blind and big blind from a positional standpoint. As expected, the button folds while the SB and BB both call. The flop comes 2h-2s-7h. Both the SB and BB check, you bet and they both fold. As mentioned, the cut-off is one of the strongest positions to be in at the table, which means that you should exploit it any chance that you get.